At a recent dinner party I delighted my guests with fragrant, soothing cups of fresh herb tea (a.k.a. herbal tisane, or infusion) served with their dessert and picked from my garden only moments before. We had eaten a filling meal, it was late and no one wanted caffeine- perfect! my herbs are always at the ready to pop into a tea pot. It was gratifying that they enjoyed it so much- a simple pleasure from the garden that I’m especially grateful for. In my view, herbs are essential workhorses of any garden and many are easy to grow and undemanding. It’s winter but in our zone 9 climate I’ve still got mints, bronze fennel, and Yerba Buena, plus sage, rosemary, oregano and sweet marjoram for cooking. 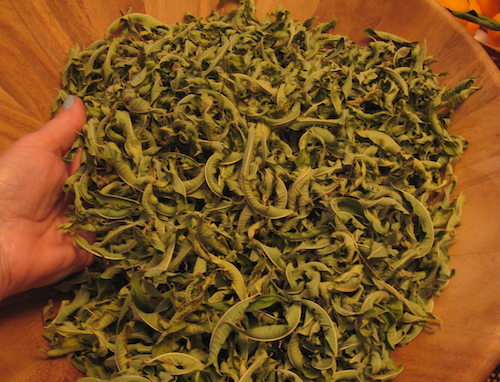 In the fall I watched diligently for the first predicted frost so that I could harvest branches of fresh lemon verbena for drying. It's frost sensitive and goes dormant for the winter but the fresh leaves (before frost damage!) dry quickly and store well in an air-tight container. It's my favorite lemon scented herb, and potent too! I often steep a tea bag or two of chamomile with herbs from my garden. I like to use it as a base to add more body to the infusion. 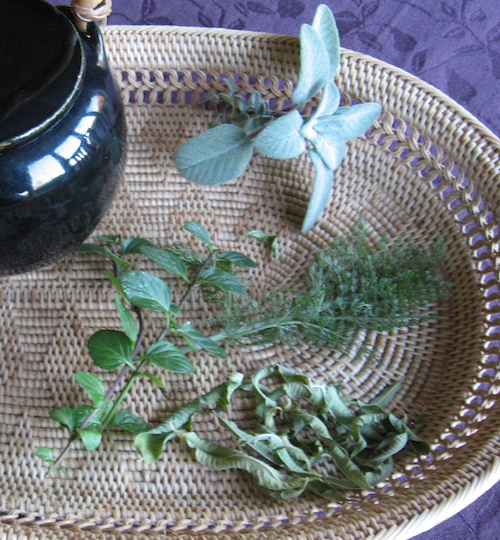 Don't be afraid to add typically "culinary" herbs such as sage, rosemary or thyme. 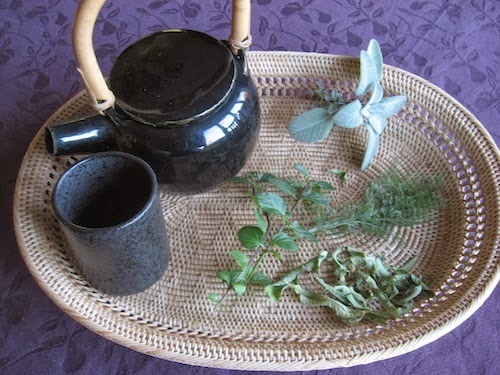 Sage adds a surprisingly pleasant and mild spice to the tea when you add just one or two leaves per pot. Rinse all fresh herbs with water and shake them dry. Add to the teapot with stems and leaves intact, add chamomile tea bag. Pour boiling water (or just about to boil) over the leaves and steep for 5 minutes before serving in pre-warmed cups. Offer honey as a sweetener. Have fun experimenting with herbal combinations and enjoy using what's available seasonally. Tip: when making herbal infusions steep the herbs while covered to capture any volatile compounds. The herbs in this recipe are known to aid digestion.